Coming Soon! NEW from USG, the Jill Full Seat Tights. 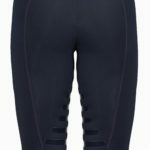 In addition to the cell pocket, these sporty and stylish riding tights feature a silicone full seat, a wide elastic waistband, and detail accents in complementary colors. The Jill’s comfortable, flattering material compliments the body and the silicone full seat provides extra grip in the saddle. Available in two colors: Black and Navy.